As disciplines, Politics and International Relations remain dominated by ideas drawn from traditions of liberal internationalism and political realism in which political imagination is preoccupied with command and order, rather than with disruption and emancipation. Yet, they have failed to offer adequate answers to why political action is foreclosed in contemporary times. Proposed through a historically informed engagement with seminal thinkers, including Walter Benjamin, Friedrich Nietzsche, Gilles Deleuze, and Michel Foucault, and examples from films and contemporary events, Ali Rıza Taşkale presents an original and much needed new perspective to interpret politics in our contemporary societies. He argues that post-politics is a counterrevolutionary logic which aims to create a society without conflict, struggle and radical systemic change. 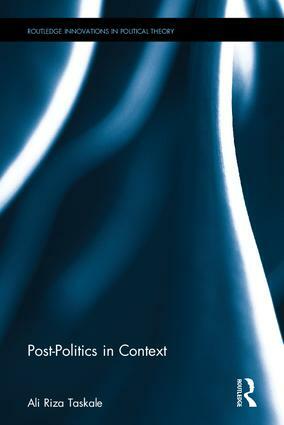 Post-Politics in Context serves as seminal intervention upon the debate over the depoliticised conditions of contemporary neoliberal society as well as functioning as an introduction to the core theoretical frameworks of alternative tradition of social and political thought in a manner that is lacking in current debates about Politics and International Relations. Ali Riza Taskale is currently an Assistant Professor of Social and Political Sciences at Hacettepe University, Turkey. His research fields are social and political theory, political philosophy, cinema and political theology. His articles have been published in Society & Space, Theory, Culture & Society and Journal for Cultural Research, along with a number of book chapters in edited volumes.